We start off in a cornfield in Landsdale, PA, where a road construction crew is shutting down for the day. One of the workers, Raymond, heads back toward the corn to retrieve his gear. He sees something odd behind the rows and walks in to investigate. The oddity he finds is what appears to be a gnarled, blue hand partially poking out of the ground (not really all that odd by creepy cornfield standards). Raymond reaches down and clears the dirt around the hand, which suddenly springs to life and grabs his wrist, pulling him down into the ground. Back in New York, Agent Olivia Dunham has been cleared to leave the hospital. Peter Bishop inspects the cane Olivia will use, looking for the "hidden ninja sword." Unfortunately, according to Dunham, her insurance did not cover that particular model. As Dunham hobbles out of the hospital, we see The Agent Formerly Known as Charlie Francis - now the shape-shifting Accident Man from last week - watching her from a parked car. Underneath the Landsdale cornfield, Raymond wakes up to find himself in a warren of underground tunnels. His legs are bloodied and torn, perhaps even chewed. He sees the carcass of a half-eaten dog. Suddenly, a shadowy creature lumbers towards the helpless construction worker. He tries to flee, but is grabbed from behind and pulled, screaming, into the gloom. In Boston, Agent Philip Broyles and Peter discuss the division requests Peter has made to the FBI. The agency has signed off on most of them - including new living quarters for Peter and his father, Walter Bishop - but has not yet been able to get the division a transport plane. Peter says that they will not need one for their next case, the disappearances in Pennsylvania - six in the last two months. Broyles asks Peter how Dunham is and tells him to keep a close eye on her. Using a toy car and a rather unlucky frog, Walter and Astrid are attempting to recreate Dunham's car accident. Astrid reveals that Walter thinks Dunham traveled to another universe during her disappearance following the accident. Walter believes that there are a number of universes like our own, where other versions of ourselves exist, each slightly different than the other. Walter cryptically warns that traveling to an alternate reality has its consequences, before telling Dunham that she'll be fine. In Landsdale, Dunham and the Bishops meet with the local law enforcement, Sherrif Golightly (probably has a sister named Holly, perhaps a big fan of breakfast), who is none too pleased with the FBI's participation. But he lets Walter take a sample of a substance they find at the cornfield and gives them access to the investigation logs - of now seven disappearances, including Raymond. As Dunham argues with Golightly over procedure, she is distracted by the buzzing of a fly, which she can hear with some sort of super-hearing. Back in the city, The Agent Formerly Known as Charlie Francis stumbles into the typewriter store and demands to use the two-way typewriter, upon which he reports that Dunham trusts him completely, believing him to be the actual Agent Francis. We plain don't like this guy. Dynamite police work from Sherrif Golightly. We learn that one of the missing men wears flannel, except in the summer. Another has a mom who makes a mean apple pie (we're happy to do that follow-up interview). Walter learns that the substance they found acts as a paralytic. Dunham and Peter follow up on a man named Hughes, who visited a few of the missing victim's families after their disappearances. We see the body of Raymond in tunnels beneath Hughes' yard. A man in work boots and carrying a shovel stands over the body, obviously upset. Above ground, Dunham and Peter meet Hughes - wearing work boots and carrying a shovel. While interviewing Hughes, Dunham's acute sense of hearing kicks in again and she can hear someone else breathing in the house. Hughes denies that there is anyone else living with him, but Dunham investigates. She finds a home lab on the second floor and thinks she hears someone in the closet. Gun drawn, she flings open the door to find nothing. Peter enters the room, startling Dunham; she fires her gun, narrowly missing Peter, who gives Dunham a concerned stare. Dunham grills Hughes in an interrogation room as Peter and Broyles watch. Hughes explains that he met with the missing folks' families because he thought he could comfort them; Hughes lost his wife and son during childbirth years earlier. Hughes denies Dunham's request for a DNA sample. While watching, Peter tells Broyles that Dunham's gun misfired, covering for her mistake. In the hospital following a check-up, Nina Sharp drops in to meet with Dunham. Sharp gives Dunham the name Sam Weiss, the man who helped put her back together when Sharp was diagnosed with cancer. She says that when Dunham is ready to see him, she believes he can help her. 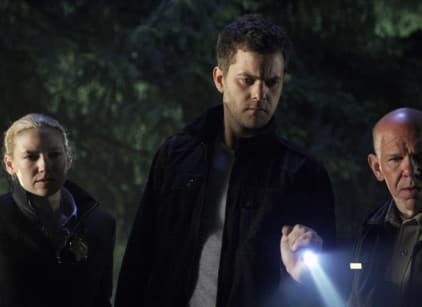 In Landsdale, Agent Jessup leads the FBI's search of the Hughes home. She finds a newspaper clipping on the deaths of Hughes' wife and son and a note from a pastor claiming it was God's will. (It's our will that we see more of Agent Jessup in this episode, but it ain't gonna happen.) Walter, wanting to study the bodies of Hughes' wife and child, asks for the bodies to be exhumed. The exhumation crew learns that the coffin of Hughes' son is empty, the casket looking like something dug its way out. They find a tunnel leading away from the open grave. Dunham states that they have some questions for Mr. Hughes, questions that will go unanswered: inside his holding cell, Hughes has hanged himself with pieces of twisted metal. As Sheriff Golightly plants posts around the Hughes home to string crime scene tape on, we see the lawn bubble up behind him. (We officially believe that this episode's monster is the gopher from "CaddyShack".) Golightly watches as a fissure in the ground shoots towards him; in an explosion of dirt, Golightly is pulled below. Dunham and Peter arrive at the Hughes house, now believing that Hughes' son is living somewhere in or under the house. Behind a wall in the basement, the pair find another rotting dead dog and a tunnel entrance, filled with the half-eaten bodies of animals and men. The creature (which we are now sure is not the CaddyShack gopher) attacks Dunham, pulling her into the tunnel. Peter follows, fighting the creature off. It tries to escape by digging through the dirt, but it loosens the sediment above, causing Golightly's car to go heavily (apologies) into the tunnels, crushing the monster. After the tunnel ordeal, Dunham confides in The Agent Formerly Known as Charlie Francis, saying that perhaps her mind is trying to protect her by not allowing her to remember what happened during her accident. Fake Francis tells Dunham that she must try to remember, as she could have learned something important. He mentions the possibility of Dunham traveling to another universe with a straight face, causing Dunham to say "You've come a long way, Charlie Francis." Oh, if she only knew. Fake Francis promises that he will help Dunham remember. In a touching moment, Peter and Walter plan a fishing trip together. We just hope they weren't planning on going in Dunham's tub - that place is not at all peaceful. Dunham's attempts to wash the day away are thwarted when her super-hearing kicks in, elevating every single noise in the bathroom, from the sound of her neighbors arguing to each individual bubble popping. She decides to search out Sam Weiss, the name Nina Sharp gave her. She meets Sam at a bowling alley, where he tells her that she'll soon start getting headaches. Probably not best for her to spend her time in a bowling alley, that being the case. Back at the steno pool, The Agent Formerly Known as Charlie Francis tells the magic typewriter that Dunham visited "the other side" but remembers nothing. As the episode ends, he receives word from his bosses: "If she can't remember on her own, then do something to help her." Astrid: We've been at this for five hours. Peter: Did you check the drawers? Olivia: Nope. Anything I've forgotten, they can keep. I don't want to spend another minute here. I'm, uh, no good at sitting around. Peter: You're also no good at letting people help you. Olivia: Oh, I'll let you carry my suitcase.